If you haven’t visited ALTARWORK, a beautiful site featuring Christian artists, musicians, and writers, I encourage you to go there and enjoy the refreshing, worshipful experience. All the above poems are found in my book, Remembering Softly: A Life In Poems. Since then I’ve met truly joyful elderly Christians who inspire me to focus on the gifts of each moment and on our abounding hopes for the future. Likewise, I’ve met Christians of all ages with disabilities who focus on their abilities and using with abandon the gifts they have (I had a wheelchair-bound friend who both painted and played basketball). I’ve met young mothers and fathers who have lost babies, or who face the fatality of serious cancers, but focus on unseen hopes, on loving and enjoying loved ones while they have life. I’ve also witnessed this kind of God-created joy in nature. As children, my sister and I had a little dog named Buster who joyously followed our escapades in the neighborhood and in the vacant lot near the parsonage. Whether we were running, skipping, skating, riding bikes, walking on stilts … Buster was there. But trouble lurked in stickery patches where goatheads pierced his little paws. He never cried or stopped. Just kept running on three legs. More than once I saw him holding up a second paw and running on two legs! We hurried to his rescue and removed the thorn(s). But I do believe that, if he had stickers in three paws, he would have tried his best to hop along on one leg. It wouldn’t have surprised me—much—knowing Buster. Nature—including our pets—can speak to us about the Creator’s ways and His provisions. We are drawn to nature photos for their calming, inspiring effect. These—and other types of photos—can add zing to blog posts and books. For instance, visual treasures—both of nature and other subjects—reside within many Cladach books. In the next few weeks I’ll dig for these treasures and share my favorites here. Today I present two black-and-white photos from Walking In Trust : Lessons Learned with my Blind Dog by Gayle M. Irwin (above and below). These photos show the joy of a dog named Sage as she experienced life and navigated her environment. Blindness didn’t stop her—or her people—from adventures (that you can read about in the book). Who would think—from these photos—that Sage the Springer Spaniel was totally blind? Sage inspires us to live fully, this moment, in the joy of the Lord. 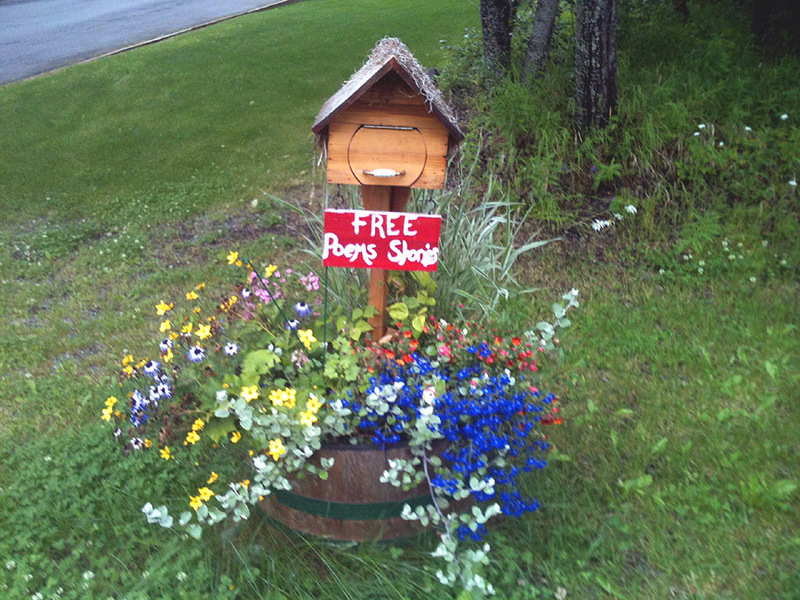 My friend, Margaret, who lives in Alaska, saw this intriguing set-up in a front yard. I think I’d be curious enough to open the little door and see what gems of stories and poems might be inside for the taking and reading. I’d feel a spark of anticipation that I might glean some insight, delight, or window into the soul of the author, who evidently loves flowers, is creative, and values people as well as written expression. If you have something to say and enjoy sharing your gift with others, you can find a way to be published!